Gout is one of those diseases that we don’t hear a lot about. In fact, it kind of has that same old-timey sound to it as consumption or pleurisy. It’s a disease that sounds like it belongs to another era, like something obsolete and no longer in existence. The reality is that gout is still very prevalent today, affecting some 3.9 percent of adults in the United States. What exactly is gout, what causes it, and how is it treated? Gout is considered a type of arthritis that causes severe pain, redness, and tenderness in the joints. It most commonly affects the joint at the base of the big toe and can make it very difficult to walk. The disease is more common in men, but women also become more prone to the disease after menopause. Attacks of gout often occur suddenly, and can last for several weeks and even months. It’s also possible to have recurring attacks, once the initial attack has passed. Gout is caused by an excess of uric acid in your blood, which accumulates in your joints. Your body produces uric acid when you break down substances called purines, which occur naturally in your body. Purines are also introduced to your body through diet; and the foods that contain high amounts of purines include organ meats, steak, seafood, beer, wine, and foods and beverages with high concentrations of fructose. Your body normally processes uric acid in your kidneys, and removes it from your body in the urine. Unfortunately, sometimes levels of uric acid are so high that your body can’t process it all and it builds up in your joints. While this buildup and pain can occur anywhere in your body, it seems to happen most often in the large joint of the big toe. When you look at the types of high-purine foods, you can see why gout was originally considered the disease of the rich – because only the wealthy could afford to eat those foods in quantities high enough to cause uric acid to build up in the blood. Today, as more people have access to high-purine foods, and at higher quantities, gout has become more prevalent in “common” people. There are two ways to treat gout. One way treats the pain caused by the gout, and the other helps remove uric acid from the blood stream, or prevent the body from producing more uric acid. Pain killers don’t reduce the amount of uric acid in the joints, but they can make the pain more bearable until the uric acid clears your system. Over-the-counter nonsteroidal anti-inflammatory drugs (NSAIDs) are most-commonly recommended for gout because they are effective and relatively fewer side-effects than other drugs. However, if over-the-counter ibuprofen or naproxen sodium do not work, your doctor might prescribe a prescription NSAID like indomethacin or celecoxib. Colchicine is a drug that is prescribed specifically for gout pain, and it is considered effective, but it also has nasty side effects like nausea, vomiting, and diarrhea. Corticosteroids are also prescribed for gout pain and inflammation, and are often used when people can’t take NSAIDs or Colchicine. You can also find natural remedy for gout pain and other symptoms from natural food stores, drug stores, holistic grocers, and online retailers. Your doctor might prescribe a special gout diet to reduce the amount of purines that you consume, and help reduce the amount of uric acid in your blood. In addition to the diet he might also prescribe uric acid-reducing medications, especially if it appears that diet alone is not helping. The medications that block uric acid production are designed to limit the amount of uric acid your body makes naturally, which should lower the amount of citric acid in your blood. It should also reduce your risk of having another bout of gout, especially when combined with the gout diet. The medications that boost uric acid removal stimulate your kidneys to pull more uric acid from your blood and into your urine. Just like the drugs that block uric acid production, these drugs could reduce your risk of having another bout of gout. Although these drugs can relieve your gout, they are not without side effects. The drugs that block uric acid production can cause rash, nausea, and impaired liver function. The drugs that reduce the amount of uric acid in your blood can cause rash, stomach pain, and kidney stones. Doctors generally try to treat with diet first, and resort to drugs if the diet is not working, or if you are prone to recurring bouts every year. Because gout is usually associated with diet, there are several dietary changes that you can make to reduce your risk – especially if you have a family history of gout. Drink plenty of fluids, especially water, which help your kidneys pull waste products out of the blood. Gout is typified by unexpected, harsh assaults of ache, ruddiness and softness in combined, frequently the combined at the bottom of the large toe. 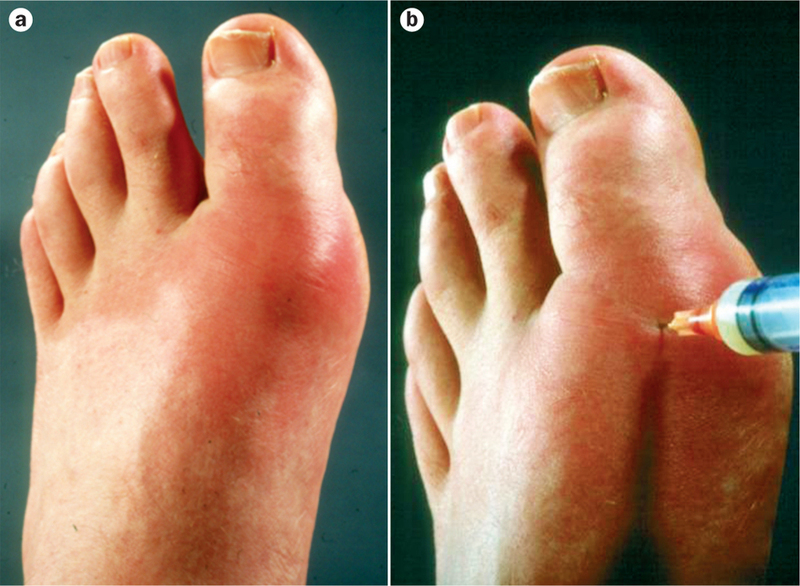 Gout is multifaceted shape of arthritis which be able to have an effect on anybody. Women are more probable to obtain gout, but women turn out to be more and more vulnerable to gout after menopause.